The last time they played at the Cluny they were in the lower chambers, they have moved up in the world, not just in Newcastle where they bumped Bootleg Blondie down the venue pecking order (they weren’t happy). Support came from the excellent Pete Williams (ukulele/guitar/vocals) and Andy Wellings (guitar). When you have a Midnight Runner on the bill, you know it’s going to be a good night. 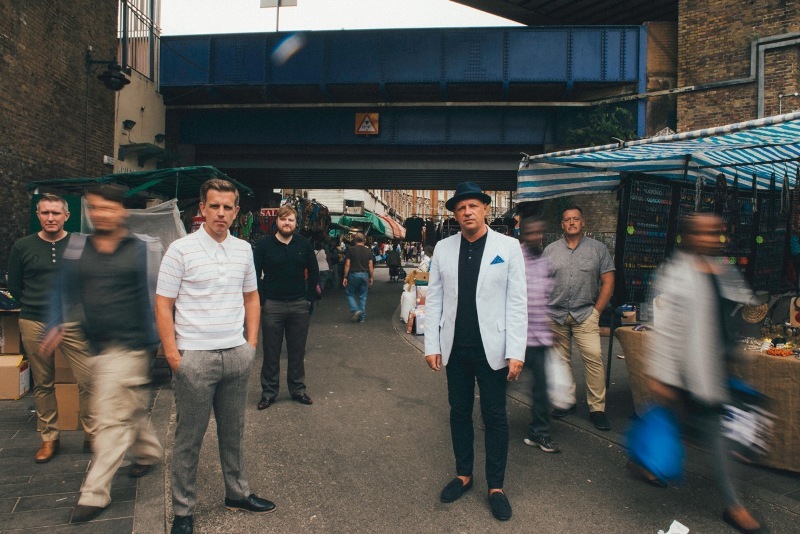 Stone Foundation have been smashing their tour, following a very respectable #25 in the UK album chart with Street Rituals; which features an up and coming young artist named Paul Weller (not to mention Bettye LaVette and William Bell of Stax fame). Tonight, playing a number of tracks from this, and previous albums A Life Unlimited and To Find the Spirit, the hefty but slightly trimmed band of triple horns (sax, 2 trumps, not that kind), percussion, drums, keys and the two Neils on bass and guitar/vocals nicely filled the bijoux Cluny stage. Their Midlands blend of pure soul and Motown inspired funk took me from a crystal blue persuasion to feelin mice elf again. And as Neil Jones’ top saturated from olive to dark green in an energetic performance the message of unity and feel-good…ness permeated the mostly mod crowd-of-a-certain-age, which included Neil’s very cool octogenarian father (not Paul Weller). His unique voice (Neil’s, not his old man’s) is perfectly suited to Stone Foundation’s UK soul style, his versatility and talent exemplified in an interlude paying homage to the O’Jays Backstabbers. A personal highlight was This Is Englandesque smash hit Beverley, a perfect introduction if you are unfamiliar with their work. This was a great gig, and I hope they keep their promise to come back to Newcastle soon, where they are very very welcome.